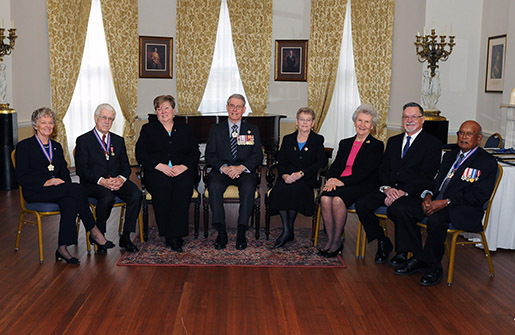 Left to Right: Alexa Ann McDonough; Silver Donald Cameron; The Honourable Maureen MacDonald (representing Premier Dexter); Lt.-Gov. J.J. Grant; Mrs. Joan Grant; J. Gay Dennis (on behalf of Graham W. Dennis); Bert Morgan (on behalf of Robert James Morgan); Bridglal Pachai. C.M., O.N.S., Ph.D., D.C.L., D. Litt. Silver Donald Cameron is a person of extraordinary talent, with accomplishments in broadcasting, education, publishing, and environmentalism. Dr. Cameron has made an outstanding contribution to the culture of the province, including helping Cape Bretoners to appreciate their unique culture and heritage. While serving as Dean at Cape Breton University, Dr. Cameron shared his deep understanding of the need to integrate liberal arts and cultural studies with professional, vocational and scientific studies, becoming a dedicated advocate of CBU’s unique Bachelor of Arts Community Studies program and working to develop relationships with complementary programs both within the institution and elsewhere. As a resident of Isle Madame, Dr. Cameron contributed greatly to the rural economic revival movement. He played a pivotal role in the founding of Telile, Isle Madame’s not-for-profit community television station. The young people who absorbed technical and communication skills at Telile are the enduring beneficiaries of the project. Dr. Cameron is a noted author of both fiction and non-fiction. He was the first ever writer in residence both at the then- College of Cape Breton and NSCAD. He is a popular author of novels, short stories, and plays. His work has won numerous awards, including an ACTRA Award, an Atlantic Provinces Booksellers Award, a Mercury Award for excellence in business communications, and a Gemini Award for best short film. Recent writings display a growing awareness of the importance of protecting and preserving the environmental integrity of our coastal areas. 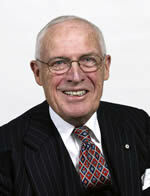 Silver Donald Cameron is a dedicated and highly respected advocate for Nova Scotia. He continues to promote an environmentally stable and sustainable future for our province. Graham Dennis started selling newspapers at the age of five, working his way up to publisher in the family business, The Halifax Herald Limited. He became a Canadian legend both as publisher of one of the last true Canadian dailies and as Canada’s longest-serving newspaper publisher. Although he described himself as “just a humble peddler of newspapers,” Dr. Dennis was an astute businessman who maintained his independence from national chains. This independence allowed him to keep the “sacred trust” between his newspaper and the people of the province. Dr. Dennis built The Chronicle Herald into the voice of Nova Scotia by maintaining full-time reporters in many communities. He passionately championed the causes of Nova Scotia, without seeking the limelight, motivated only by a personal desire to make Nova Scotia a better place. 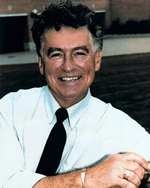 Dr. Dennis led a life devoted to service. He was a philanthropist who cared deeply about humanity. If an event or an organization strengthened the province, he went out of his way to offer his full support, often anonymously. The full extent of his generosity to a wide variety of causes, charities, and events will never be fully known. Graham Dennis was a devoted family man, an outstanding businessman, a passionate promoter of our communities, and a generous supporter of worthy causes. He was a role model, a mentor and an outstanding Nova Scotian. He leaves behind a legacy of responsible journalism and a life devoted to only one goal, to make Nova Scotia a better place for Nova Scotians. Alexa McDonough’s commitment to social activism and community involvement has spanned her lifetime. At the age of 14, with her youth colleagues, she organized a day camp for the children of Africville, bringing public attention to the living conditions in Africville, and setting her on her life’s path as a passionate voice for human rights and social advocacy. In the mid-1970s, as Social Action Chair at the YWCA, Dr. McDonough obtained grants to retrain women in non-traditional areas such as plumbing, painting and wiring. Training women in these roles was virtually unheard of in 1976, but Dr. McDonough was an advocate for gender equality, committed to offering women the widest possible range of employment opportunities. By the time Alexa McDonough entered politics in 1979, she was recognized for her commitment to social issues, human rights and community action. She was elected Leader of the New Democratic Party of Nova Scotia in 1980, becoming the first woman to lead a major recognized party in Canada. During her tenure as a member of the Legislature, she was at times the only woman in the House of Assembly. In 1995, she became Leader of the New Democratic Party of Canada, a role she held for eight years. 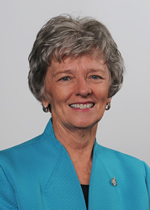 After retiring from political office, Dr. McDonough served as Interim President of Mount Saint Vincent University, where she hosted a world peace conference, bringing together international leaders in peace education, women’s activism and nuclear disarmament. Alexa McDonough has received national and international recognition for her work on human rights and global poverty. She continues to work for a better community and a better world. She is a committed volunteer and an inspiring role model. The late Dr. Robert Morgan devoted over 50 years to the preservation and sharing of the history of Nova Scotia, particularly that of Cape Breton Island. Dr. Morgan came to Sydney in 1962 to teach history at what was then Xavier Junior College. He developed a passion for the local community and worked tirelessly to explain the history of Cape Breton, to help preserve its heritage, and to promote a future for Cape Breton rooted in respect for its many cultures and anchored upon local community economic development. Dr. Morgan made an outstanding contribution to the archival community, the heritage sector, and the scholarly field of local history. He served with distinction as senior historian in the development of the Fortress of Louisbourg National Historic Park, as a founder of the Old Sydney Society, as archivist of the Beaton Institute and as a professor of history at Cape Breton University, where he helped to develop the Cape Breton Studies, Cultural Studies, and Museum Studies programs. Dr. Morgan was known for his willingness to support even the smallest project around the Island. Through the force of his integrity, good humour and passion for local history, he left behind people with a renewed interest in preserving our culture and heritage. 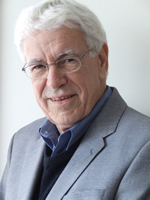 In his retirement, Dr. Morgan remained active at Cape Breton University and throughout the Island, offering history courses for seniors and special interest groups. His great legacy to the province is the two-volume Rise Again! The Story of Cape Breton Island, the first full-scale history of Cape Breton in nearly 150 years. Bridglal Pachai has distinguished himself as an author, professor, administrator, mentor, and human rights advocate, carrying out these roles with dignity, compassion, and single-minded firmness. Dr. Pachai was born and raised in the most difficult years of apartheid South Africa. He relentlessly pursued education, becoming the first black in South Africa to earn a doctorate in history. He immigrated to Nova Scotia with his wife and family in 1975, with frequent visits to Africa to teach and provide leadership in education. In 2000, he became a member of the Order of Canada. Dr. Pachai has served as a director of the International Education Centre at Saint Mary’s University and taught at Saint Mary’s, Dalhousie, and Mount Saint Vincent universities. He headed the Black Cultural Centre during its formative years. 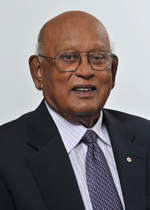 Dr. Pachai served as the Executive Director of the Human Rights Commission, where he advocated for the application of the legislation protecting his fellow citizens from discrimination. Dr. Pachai has become a noted authority on African Nova Scotian history. His published works include Blacks in the Maritimes, Historic Black Nova Scotia, and The Nova Scotia Black Experience through the Centuries. He also published two autobiographical works, a novel based on his African experiences and, most recently,the philosophical Dialogue between head and heart: a testimony on the value of education. Bridglal Pachai has made outstanding contributions to educational institutions in Nova Scotia and Africa. He has furthered human rights causes both at home and throughout the world. He continues to distinguish himself as a scholar, a humanitarian, and a tireless advocate for social justice.